Teach dog to speak - the benefits of bark commands.. Teaching your dog to bark (or speak) on command is not only a fun trick to perform for your friends, but by adding the QUIET command to your dog's list of learned behaviors you might just find the solution to the excessive barking problems. Through these two dog obedience training lessons: Train Dog to SPEAK and Train Dog to QUIET your Miniature Schnauzer will learn when his dog barking is welcome and appropriate behavior and when it is not. Teaching your Miniature Schnauzer to bark or speak on command is fairly easy to do. After all, your Schnauzer already enjoys to bark, right? First, you need to choose one simple command word... speak, talk, bark, etc... (in our example we'll use the word SPEAK) Now get some yummy dog training treats and we're ready to begin. Have your Schnauzer sit in front of you. Bend over slightly revealing to him a dog treat in the palm of your hand. Take your other hand and pick up the dog treat with your index finger and thumb. Quickly draw the treat high up towards your face and say SPEAK in a high-pitched, friendly, enthusiastic tone. The quick motion along with your excited tone will cause your Miniature Schnauzer to fidget and possibly bark. If your Schnauzer does not bark, wait for 15 seconds in silence just holding the treat by your face and watching him. This awkward silence and staring at the treat will probably cause him to bark. If he eventually barks, treat and praise him. If he still does not bark, repeat the SPEAK command process from the beginning. Be sure to use a friendly enthusiastic tone in you voice. Wait for your Schnauzer to reply with a few sharp short barks. Then treat and verbally praise him. Most Miniature Schnauzer get this trick right away, but if yours does not just continue repeating the process. Eventually your Miniature Schnauzer will bark for the dog treat. Once your Schnauzer has mastered speaking or barking on command for a treat, continue training him using only verbal praises for his reward. With daily training sessions your Miniature Schnauzer will master the SPEAK command. Now that we have our Miniature Schnauzers trained to SPEAK on command. It's time to get them to be QUIET. Once again, you first need to choose one simple command word... hush, quiet, enough, etc... (in our example we'll use the word QUIET) Now get those yummy dog training treats and we're ready to begin. Start by having your Miniature Schnauzer sit in front of you and command him to SPEAK using only the verbal command and no praise for doing so. When he barks, say QUIET in a loud sharp tone and show him the treat. Your Miniature Schnauzer will quit barking and focus on the treat immediately. Give your Schnauzer the treat along with a verbal praise. Repeat this process a 5 more times. Your Schnauzer now has a very basic understanding of being quiet. At this point, we will teach him without commanding him to SPEAK but rather enticing him to bark and and then apply the correction. Now go to your front door and knock on it. This action should elicit a bark from your Schnauzer (if you need to, open the door and ring the door bell to make him bark). As soon as your Miniature Schnauzer barks say QUIET in a loud firm tone and make one sharp clap of your hands. As soon as he stops barking and looks at you, treat and praise him. Repeat this process 5 more times, gradually increasing the length of time your Miniature Schnauzer must remain QUIET before getting his reward. Practice this training daily several times in 5 minute intervals, until your Miniature Schnauzer masters the QUIET command for verbal praise only. Training your Miniature Schnauzer to be QUIET takes a bit longer than training him to bark. Dog Training Tip: Throughout the day, don't miss any opportunities where you can reinforce the QUIET command. 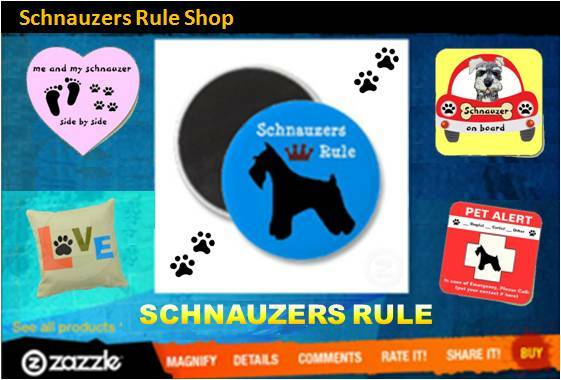 Use it to correct your Schnauzer's excessive barking behaviors throughout the day - ever day. Once your Miniature Schnauzer has truly mastered the QUIET command, continue QUIET training but only during the times of the day your Miniature Schnauzer's barking is a problem. Use treats sparingly. Use dog treats as a reward every now and then, and verbal praises other times. This helps reinforce the training process since your Schnauzer isn't sure if this will be the time an actual dog treat is offered up as his reward for being QUIET. Always be consistent with your commands and patient with your Schnauzer. He will eventually learn when and when not to bark, it just takes time.